My favorite source for scripts is DynamicDrive, which has hundreds of free scripts that are conveniently categorized to help you find what you’re looking for. Their tag line is “DHTML scripts for the real world,” and that’s a pretty good description of the site. 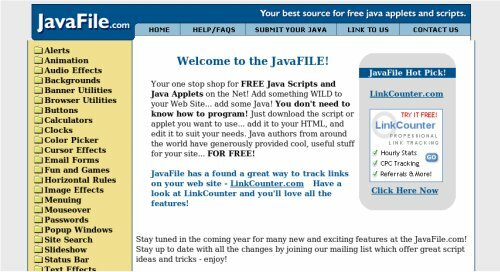 Even if you are relatively new to web design you’ll find plain and simple instructions with most scripts that make them little more than a cut and paste. 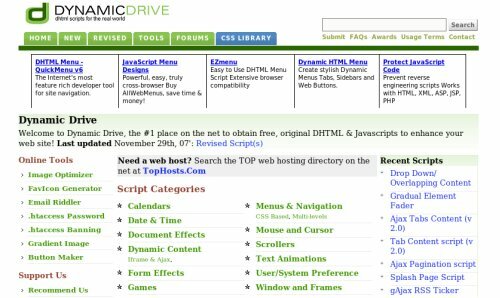 Some of the categories of scripts found on DynamicDrive include form effects, menus and navigation, XML and RSS, image effects, and more. The menus and navigation section includes CSS-based menus as well as multi-level menus. In fact, DynamicDrive even contains a CSS Library that provides some of the best CSS navigation scripts you’ll find anywhere. One of my favorite resources on the site is RSS Display Boxes, which allows you to easily include RSS headlines, excerpts or full posts on any website. In addition to the scripts, DynamicDrive also has several useful online tools such as an image optimizer, favicon generator, gradient image maker, button maker, and a few others. From the home page you’ll see the latest additions to the script library, which can be really helpful if you are a frequent visitor or if you are just looking for the most current and up-to-date scripts. There really are so many scripts here that you have to just browse through to get an idea of everything that is available. If you’re working on a new website or trying to improve an existing one, you may just find something at one of these sites that puts your design over the top. One caution: be sure not to go crazy and add too many scripts to your pages. Not only will it slow down the load time and affect the performance of the site, but it can create an overwhelming look for your visitors. Find the scripts that would bring the most benefit to your site and stick with them. I must start playing with scripts more often. Thanks for the sharing these Steven. Yeah, if you don’t visit these types of sites very often you may be surprised by everything that’s available. Some of it is cool but not really that useful. A good find though will make a site a little more interesting for visitors.